"His trumpet leaps and tumbles brassily over even the most sedate support, invoking a few other musical idioms along the way; it would be good to hear more of Tommy T. these days." 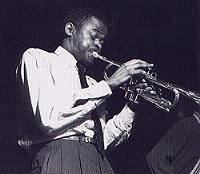 For several years, jazzmen who grew up in Pittsburgh or who have passed through the city usually cite trumpeter Tommy Turrentine as a prime example of an imaginative musician who has not yet received much attention beyond the circle of his peers because he has chosen to spend much of his time working at home rather than in New York, Chicago, Los Angeles or San Francisco where national reputations are started earlier because those are the cities where the writers and record companies are. Tommy's name, however, is becoming more widely recognized as a result of his travels since March of 1958 with Max Roach's unit; and now, this first album under his own name should serve to increase the size of his audience. Also on the album is the robust tenor saxophone playing of Stanley Turrentine, born in Pittsburgh in April, 1934, six years after Tommy. Their father had once been a member of the Savoy Sultans, and still occasionally plays tenor saxophone around Pittsburgh. A third Turrentine brother, Marvin, 15, is just beginning to learn drums. Although he has played much in Pittsburgh, Tommy Turrentine has had big band experience with Billy Eckstine, Dizzy Gillespie, Count Basie and Benny Carter. He was also with Earl Bostic for two years. Stanley's first job when he was 16 was with a small unit Tommy led in Pittsburgh. He was also with the Lowell Fulson rhythm and blues band when Ray Charles was featured pianist; played alongside his brother in Earl Bostic's combo from 1953 to 1955; spent two years in the 158th Army band; and joined Max Roach along with Tommy in March, 1958. Max is impressed by the work of both Turrentine brothers. "None of them," emphasizes Max, "are of the imitative school. You can hear influences, of course, in what they play, but each of them sticks to his own guns." Tommy Turrentine's influences have included Dizzy Gillespie, Charlie Shavers, and more recently, Kenny Dorham. His work is fresh, particularly in the order and the long-lined suppleness of his conception. A selected discography of Tommy Turrentine albums.  Tommy Turrentine, 1960, Time.  Speakin' My Peace, 1960, Blue Note.  On The Spur Of The Moment, 1961, Blue Note.  Landslide, 1961, Blue Note.  A Fickle Sonance, 1961, Blue Note.  Leapin' And Lopin', 1962, Blue Note.